Submitted by Christina Fox on Wed, 19 Feb 2014 - 14:24. When you’re faced with something like this – It is hard to know where to start. After a first flush of enthusiasm, many people give up because allotments are such hard work. Your excitement can disappear at the thought of wading through someone else’s rubbish. My allotment is about 6m by 15m (a half plot). When I took it over there were a lot of weeds about knee high. 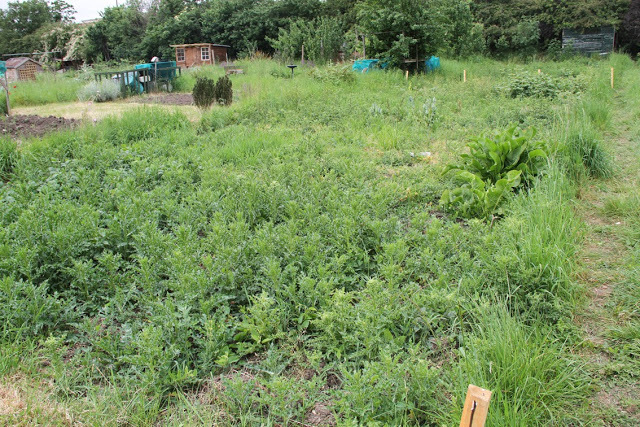 It was covered in thistles, bindweed and couch grass – three perennial weeds. There were a few brambles – but not much. Plus it had all the annual weeds that blow in from neighbouring overgrown plots. I have a full time job so, I knew it wouldn’t be possible to dig the whole thing quickly. Also I didn't want to put my back out. I decided to do a little and often. First - I tried digging a patch but the couch grass, bindweed and annual weeds soon grew back. I quickly learnt digging is not enough. I really didn’t want to use chemicals – but to get started I felt I didn’t have much choice. So I used the weed killer glyphosate (Roundup). You need to spray this on growing weeds (not the soil). It is absorbed by the plant’s leaves and gets into the roots. Because to win the battle with perennial weeds you must kill the roots. Now even the manufacturers will tell you that one application may not be enough. And sure enough - the couch grass, bindweed started to grow back – if a little weaker. It had no effect on the brambles. You see - Weedkiller is not enough, digging is not enough. First of all you have to be patient and accept you’ll never eliminate all the weeds – not on an allotment. There are just too many weed seeds already in the ground and blowing in from other un-kept plots. But couch grass and bindweed can be controlled if you are determined. My problem is that the previous plotholder only grew potatoes and rotovated it every year. Rotovators chop up the roots of the perennial weeds and they grow back from each tiny piece. Rotavating gives you a short term fix as the plot looks great. But, in the long term you will regret multiplying the weeds you already have. So, unless you have weed free soil. DO NOT ROTOVATE. Still don’t believe me – see what Rick has to say at 7min 30sec into the video – about the biggest mistake he made on his allotment. Buy yourself a good fork and spade - then DIG. Dig slowly and methodically- pick out as much of the roots as you can find. Do NOT compost the roots. They will not rot - they will not die. BURN THEM! Firstly, see this as a long term project – think in seasons and years – not days and weeks. Tackle a small amount at a time. It is suppose to be pleasurable – not an endurance test. Don’t compost weeds that have gone to seed. You’ll just end up spreading them back on your plot. Strim your weeds, make a big pile, let them dry out and burn them. You can add the ash to your compost heap or directly onto the soil - it won’t go to waste. If the weeds are growing but haven’t gone to seed…. Strim the weeds, make a big pile, and make a compost heap. This will give you a chance to see what you’ve inherited on the plot (there’s nearly always some rhubarb in there somewhere. Strimming stops the weeds setting seed and starts to weaken them. Your neighbours will appreciate the effort too. Your weed seeds are their weed seeds. Now you know what you have - mark out a small patch to grow something. The soil at Northfields is clay and at times can set like concrete. So don’t try and dig it when it is dry. Wait for some rain or water it first. Then you’ll be OK to start digging and planting. This should give you a warm fuzzy feeling. You are on your way. To weaken the weeds strim them and then cover them. The followers of Permaculture recommend you cover the soil with cardboard (link is external). To stop the cardboard blowing away, cover it with a weed suppressing membrane or cheap plastic tarpaulin – add a few bricks on top to weight it all down. Also watch Mike Feingold in this video – lots of great advice about cardboard and what to do with bindweed roots. Supermarkets, local shops and freecycle (link is external) are a great source of cardboard. For bricks try freecycle (link is external) and local skips. You can buy a cheap, large plastic tarpaulin from Amazon (link is external) to cover the cardboard. You need to exclude the light. This will slow down the growth and importantly stop more weed seeds blowing onto the soil. Over the coming months (be patient) the cardboard will rot down nicely and when you uncover it – you should find soil that is easy to dig. If you’re not ready to grow any fruit and veg on that patch - grow a green manure (link is external). * It grows quickly so acts as a living weed suppressing membrane. Clover is also a great green manure - it adds nitrogen to the soil and it can be dug into the soil pretty easily. 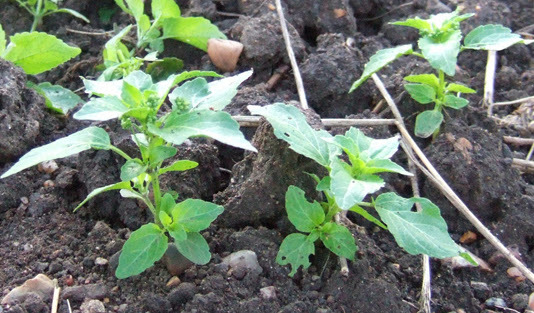 What ever you do try NOT to leave the soil uncovered – in a few weeks the weeds will be back with a vengeance. Please don’t use carpet to cover the soil. Firstly it is full of chemicals which are not good for soil used for growing food. Secondly – if it is left too long, weeds grow through it and it becomes a nightmare to get rid of. If it is already on your plot - you will curse the person who left it for you to remove. Use cardboard and a plastic tarp or weed supressing membrane. But stay away from the carpet ! I really wanted to be organic but after my first attempt at digging alone - I became a (temporary) fan of glyphosate (roundup (link is external)). I’d recommend the ready made version in a container with a spray nozzle. Glyphosate can also be bought as a powder that you mix with water – this is cheaper – but you’ll need a separate watering-can to apply it. It takes around 3-4 weeks before the weeds die above and below ground. You’ll know if it has worked because everything will turn very satisfying brown and die. Couch and bindweed will die back but some of their deeper roots will survive. Brambles will go a bit crispy on top – but will survive. You can see they are still green in the picture above. Brambles will have to be dug out – their roots are deep and woody. You can also try lighting a fire on top of a bramble patch to kill the roots with heat. Check the weather forcast as you will need a few dry days. You must apply glyphosate to weeds that are growing. It will be absorbed into the leaves and most importantly down into the roots. This will definitely kill any annual weeds. I must admit I have only needed to use it twice. Now I am totally chemical free. Once everything looks like it has died – it is time to get at any perennial roots. The only saving grace of couch grass and bindweed is that it is very easy to see their roots as they are long and white. Learn to be a slow, methodical digger. It can be very satisfying removing a long weed root in one piece. Try not to leave any pieces of root behind – they will all form new plants. I did try and sieve some of my soil. But, it just took too long. Even I wasn’t that patient. Once you have dug things over a whole new slew of weeds will appear (it never ends). The good news is – these will be mainly annual weeds. Buy yourself a hoe. A good hoe will get these little blighters before they become too big and start setting seed. Glyphosate – is very efficient and will be broken down in the soil. But, you will probably need to give a second dose to couch grass and bindweed – which has more lives that the local cat. I’m still fighting the bindweed – I think it’s going to be a long battle. Weed seeds grow quickly on allotments. Go on holiday for a couple of weeks and you’ll be weeding for days afterwards. It is a constant job – so an hour weeding here and there through the week is recommended. Did I mention – allotments are very time consuming… that’s why the archetypal allotmenteer is a retired pensioner. Northfields has a lot of Fat Hen and Annual Mercury – annual weeds which grow very quickly. A single Fat Hen plant can produce 20,000 seeds. But is easy to hoe as it has shallow roots. I learnt to think of them as uninvited green manure - as long as I catch it before it goes to seed. So, I learnt never to leave bare soil. If you are not growing in a patch of soil – cover it. I do what the permaculture guys do and cover with cardboard (next to the soil) and a weed suppressing membrane over the top – add a few bricks/logs paving slabs or anything else that is heavy to stop it all blowing away. This will reduce weed seeds flying in, and any that have survived the digging and the glyphosate will come up and be weak and leggy (so easy to deal with). There is a tendency to buy lots of tools when you start – but one of the most important things you’ll need are some planks to stand on. If you walk over your newly dug soil it will become impacted. Dig – then put down a plank to use as a path and work from there. Look out for old scaffold planks - very tough although a bit heavy. Check out your local skips and free cycle for planks. The soil at Northfield is clay. If you dig a couple of spades deep you’ll find clay a potter would be proud of. This means that when it is dry it sets like concrete. No rain means - no digging. But, if you need to dig during a dry spell. Just water the ground – leave for a few minutes and you should be ok the dig. All the books will tell you to sow seeds into a “fine tilth”. But they don’t explain how you get a fine tilth in the first place. Watch Dan’s video on how to do it. He starts by digging over his plot and letting the frost break up the soil. Then he uses a three pronged cultivator (link is external). It is now my favourite tool. I also have a smaller one too. I hope you found this helpful.